Raw data exchange between IMs based on the TAF/TAP TSI framework is already in place with large companies running international railway businesses such as Eurostar, SBB Cargo Int, DB Schenker Rail, BLS Cargo etc.. The filtered exchange of data makes the process more efficient and the user’s maintenance efforts could thus be reduced significantly. Besides the Common Interface, RNE is now offering an additional convenient interface for small and medium sized railway companies/terminals/waggon keepers for automated data exchange from TIS to the railway company and vice versa. The current RNE Common Interface was just enlarged with an additional file service connector. Please find the technical details below. 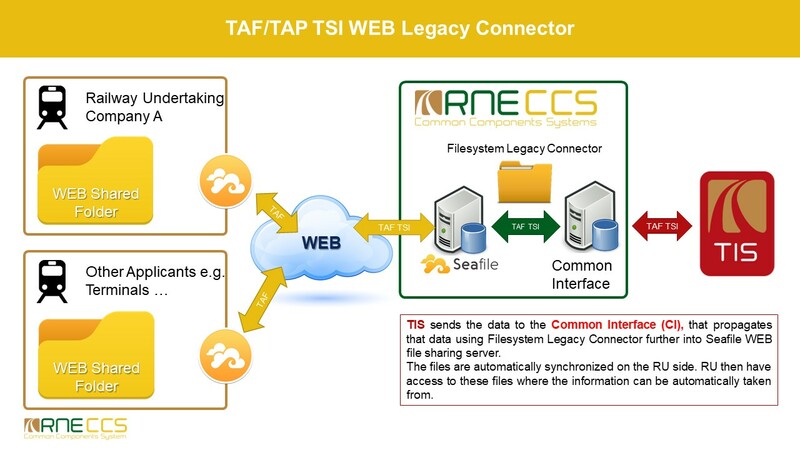 The RNE Common Interface (CI) will store the particular TAF TSI messages in the cloud, where the client can access them and automatic sync will be carried out to the clients device. All messages will be based on the TAF TSI framework. This interface is limited to a defined number of messages per day. If the number of messages exceeds the defined ceiling in a defined time frame (day or month) the customer must apply for the standard interface (RNE Common Interface and TIS RU interface).